I managed to drop by Takashimaya’s Mid Autumn Festival about 3 weeks ago, behaving like a typical Singaporean with typical Singaporean friends, getting stuffed on lots of free samples. Not that I was trying too but it just happened. Anyway let me let you in on something random. Somehow or another, I tend to get the feeling that girls are a lot more open to free samples, while guys seem to feel a lot more compelled to buy something after receiving a free sample. So yeah, word of advice to those in sales or marketing, extend your free samples to guys for a more successful return on capital. Personally I haven’t been much of a mooncake fan, but 2 booths managed to impress me much. First, there’s the Teochew Fried Yam (Orh Nee) Mooncakes from Long Jiang, whose samples were almost 1/6 piece of a mooncake and served piping hot. Definitely the most generous serving of mooncake of all the booths in the fair. I believe word is going around that Peony Jade has awesome Fried Yam Mooncakes as well so I’m looking forward to try it next year. Secondly, I’m also enchanted by East Ocean’s Snowskin Mooncakes. While some feel that the Custard, Yam and Green Tea Snowskin Mooncakes from East Ocean are too mild, I like their delicate flavours and textures just the way they are. The Mid Autumn Fair at Taka is ending on 12th September if I’m not mistaken. So, if you haven’t headed down yet, maybe you could consider dropping by and snacking on all the free samples! You’d be a mooncake connoisseur by the time you are done. In celebration of the Mid-Autumn Festival, Din Tai Fung launches two Yuan Yang delights for families to savour and enjoy. Pairing well-loved traditional flavours like red bean, white lotus and yam, these sweet treats are available at all Din Tai Fung outlets in Singapore, from 2 September to 15 October. Inspired by the Mandarin Duck, or Yuan Yang Ducks (鸳鸯鸭子), the two desserts epitomise the creative pairing of ingredients to create a unique blend of flavours. The Yuan Yang Duckling Pastries and Steamed Yuan Yang Dumplings boast of rich, layered notes and a lingering aftertaste – a perfect treat for loved ones and friends during this festive season. Available from 2 September to 15 October 2011, while stocks last. Making its annual return during the Mid-autumn Festival, Din Tai Fung’s Steamed Yuan Yang Dumplings are lauded for their fusion of premium Taiwan-imported, finely mashed red bean and yam paste, achieving a rich flavour and fragrant aroma unlike no other. Enveloped in Din Tai Fung’s exquisite xiao long bao skins, the dessert enjoys a much anticipated annual revival during the Mid-autumn Festival. 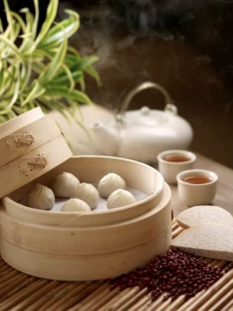 Citibank cardmembers enjoy complimentary six pieces of Steamed Yuan Yang Dumplings with a minimum spend of S$70. Members of the public enjoy complimentary six pieces of Steamed Yuan Yang Dumplings with a minimum spend of S$80. Available from 5 September to 15 October 2011, while stocks last. Specially created for this year’s Mid-Autumn Festival, the Yuan Yang Duckling Pastries come in a set of two traditional Chinese pastries (one Red Bean filling, one White Lotus filling), crafted to resemble Mandarin Ducks. Invoking sweet childhood memories among young and old alike, the sweet treat is made with high-grade white lotus and red bean paste. Packaged in a specially designed box, the Yuan Yang Duckling Pastries make for a great gift to present to friends and family during this joyous season. Prices stated are before GST and Service Charge. We have been following your food reviews at HGW and we admire your flair for writing and most importantly, honesty! As such, we will like to invite you to join our food tasting community! Upcoming tasting sessions include L’Angolo, La Noce and The Tastings Room. You even get to bring your friends along for the session if you’re chosen! Let us know if you’re keen to take up the offer!